One of the final films worked on by the late Tony Scott, Stoker is a psychological thriller that shows a lot of promise but in the end simply doesn’t deliver. Tony Scott produced Stoker with his brother Ridley, along with Michael Costigan. Acclaimed South Korean director Park Chan-wook made his English-language debut, instilling the film with an unsettling sense of paranoia. First-time screenwriter Wentworth Miller was quite openly Hitchcockian with the conception of Stoker, borrowing a bit from Shadow of a Doubt (1943) specifically with the shared plot element of a shady uncle and his niece. India Stoker (Mia Wasikowska) loses her father, Richard (Dermot Mulroney, appearing only in flashbacks), to a fatal car crash on her 18th birthday. 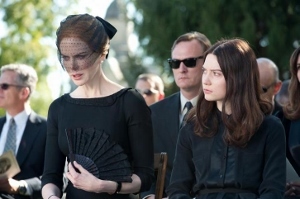 The already sullen India becomes even less sociable, an attitude not helped by her chilly relationship with her mother, Evelyn (Nicole Kidman). At the funeral, she meets her father’s brother for the first time. In fact, she didn’t even know Uncle Charlie (Matthew Goode) existed. Evelyn wasn’t close to him, but India still holds a grudge over having never been informed she had an uncle. Matching India’s weirdness step-for-step, Charlie makes it clear that he aims to both replace Richard and become India’s first love. Yes, it’s as creepy as it sounds. People start disappearing in India’s life, a mystery eventually solved during a trip down to the Stoker’s basement freezer. Charlie brought home ice cream, but India finds something she perhaps wasn’t meant to. As the depth of her uncle’s depravity becomes clearer, India begins exhibiting signs that she may in fact share many of his sociopathic tendencies. 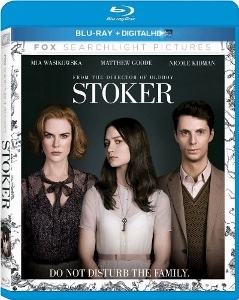 Stoker’s plot is quite thin and revealing more would do it a disservice. Unfortunately, the characters are rather thin as well. Chan-wook’s carefully cultivated atmosphere never ends up going anywhere. Character motivations become clouded. Is India meant to be sympathetic or not? Her inconsistent behavior (impossible to elaborate on without needlessly spoiling things) leaves a little too much to the imagination. The cast does everything they can with the material but no one ends up creating a full-bodied characterization. Goode, especially, captures a seductively sinister vibe that makes Charlie the most interesting of the principals. It sadly doesn’t add up to more than a stylish exercise. That style carries over into the look of the film, with Chung-hoon Chung’s 35mm cinematography contributing to the dark, moody atmosphere. Fox’s Blu-ray presentation is pretty much flawless. The evocative cinematography maintains a high level of clarity and detail. The DTS-HD MA 5.1 soundtrack is spooky in the subtlest of ways, particularly during scenes when what is apparently the shared super-hearing abilities of India or Charlie are explored (an odd element that is noteworthy for being entirely unnecessary and undeveloped). Special features include deleted scenes, several featurettes, still photo galleries, and premiere footage.